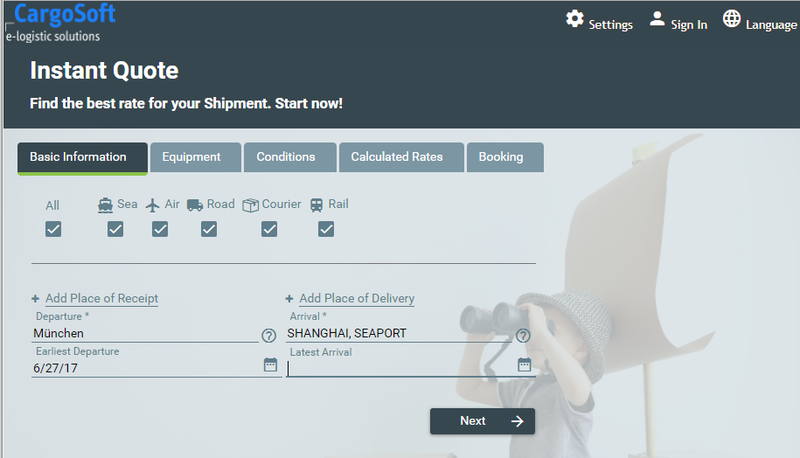 The online platform enables logistics providers to offer their clients and prospective customers a price-based online booking portal – even for complex transports with multiple carriers. Characteristics we would like to particularly emphasize are the fast cost calculation for individually combined transports (sea – air – road – courier – rail) and the effortless data entry. By entering the planned transport routes and shipment details, users immediately receive suitable quotes. eForwarding automatically sends a confirmation to the client and contractor via email as soon as the booking has been completed. Authenticated users can access the dashboard with all transacted quote requests and bookings. The current status of all booked shipments is available in the tracking feature. Operators of the CargoSoft eForwarding portal are in control of and have access to all transacted quote requests and bookings. All information is saved and can be viewed and assessed at any time. The option to integrate your corporate identity (colours, graphics, fonts, etc.) even adds to the value of the professional and visually appealing online presence of eForwarding. eForwarding consists of the three CargoSoft modules ECM Rate Management (Enterprise Condition Management), eBooking and eTracking. Bookings issued in eForwarding are automatically made available in TMS through the CargoSoft Booking Monitor. The order is subsequently invoiced in TMS based on the conditions determined in the portal. Make use of the diverse possibilities the new CargoSoft eForwarding online portal has to offer for quotes and bookings for complex transports. Offer your clients a price-based online booking portal which enables them to request transport quotes from your rate system and immediately start the commissioning. eForwarding contains the following modes of transport: Air & Ocean, Road and KEP. eForwarding can be integrated into the already existing transport management solutions CargoSoft TMS or external TMS systems. eForwarding streamlines operating processes and creates a transparency for your clients. eForwarding is a white label and can be individually customized to suit your corporate design and identity.